Owned by Janelle and Ryan McKenzie of Rycon Building Group (RBG), this gorgeous Hamptons-style Melbourne family home was built recently and boasts all the trimmings. 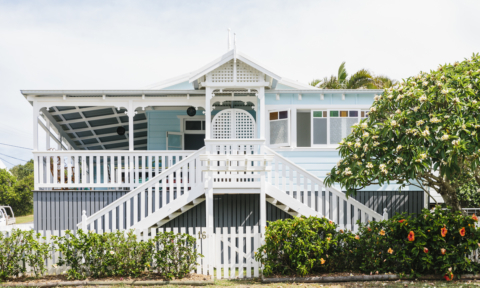 Designed to double as a property to take their clients through (RBG specialise in Hamptons-style homes) the home boasts interiors by KWD and the details are rather lush. Lounge and dining room – that fireplace is fabulous! 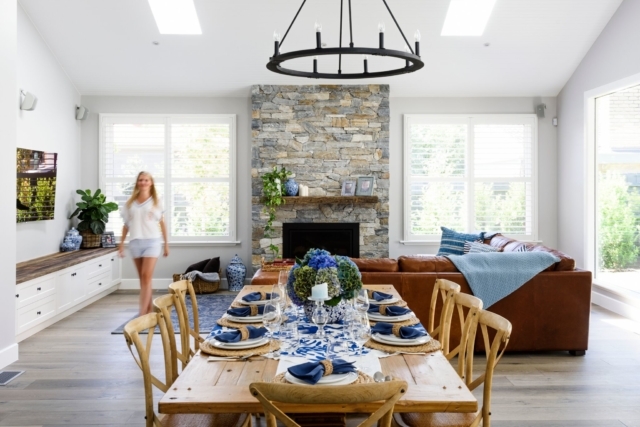 “The owners wanted to create a Hamptons-style house with a relaxed and homely feeling that is open, light and textured. They also wanted to create resort style living, without having to leave home,” says Kate Walker. Given landscaping is a Hamptons design hallmark, it’s not surprising that the home’s backyard is a highlight. Comprised of a swimming pool, pool house, outdoor shower, gym, sauna, vegetable patch, basketball and soccer mini-courts, the home’s outdoor areas are key to the resort feel too. 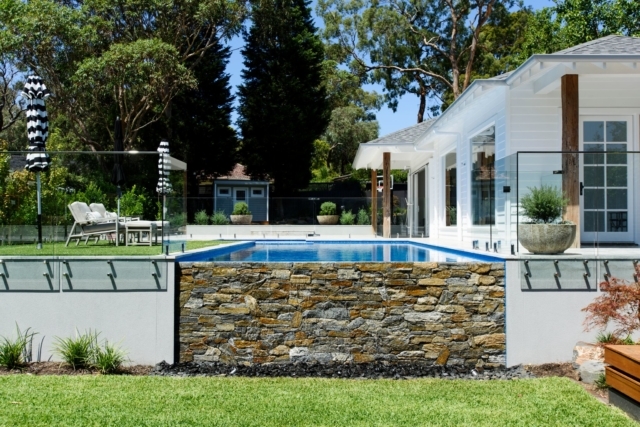 “What really brings this amazing property together is the time and attention to detail spent on the landscaping. Landscaping is so important, and we always recommend leaving enough money in the budget to do the landscaping properly,” says Kate. The backyard features a pool house on the right. 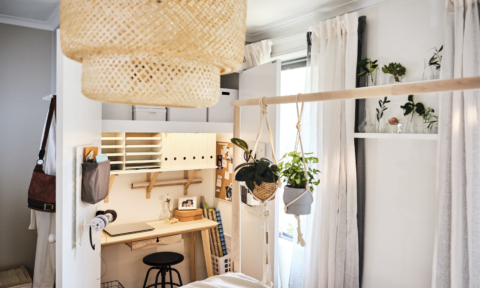 “The home is on a large piece of land, and every part of it was carefully designed to create the resort-style living the owners were aiming for, with child-friendly features that provide heaps of fun and entertainment. Making the outside match the inside is all part of the story too,” says Kate. 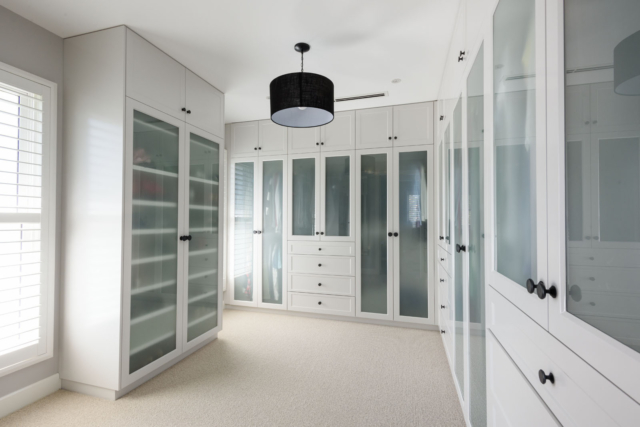 From the expansive walk-in pantry to the wardrobes and children’s play area, the home has plenty of clever storage concealed behind stylish blue and navy joinery. 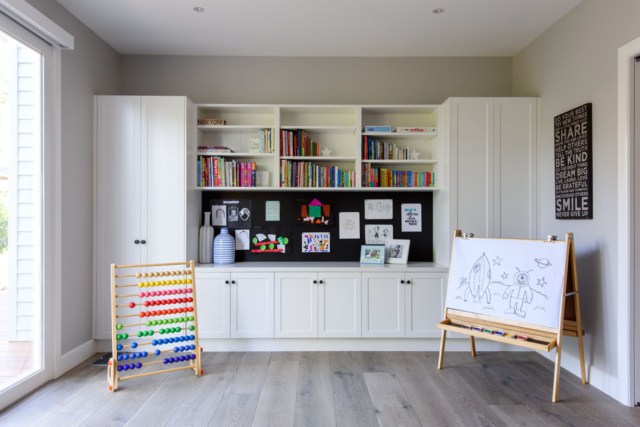 “The children have their own bathroom and playroom as well as large bedrooms with plenty of functional, stylish storage,” says Kate. 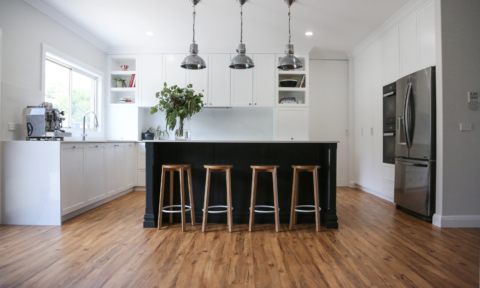 At the centre of the home, the kitchen is another design triumph. 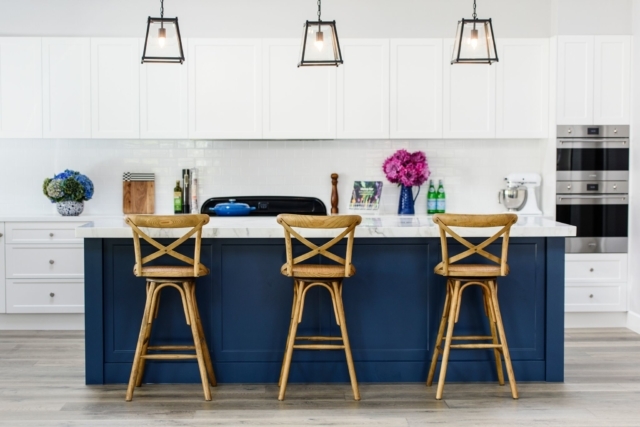 Combining a Calcutta marble island bench with white shaker-style doors, navy joinery, pewter tapware and statement pendant lights, it certainly captures the Hamptons vibe. 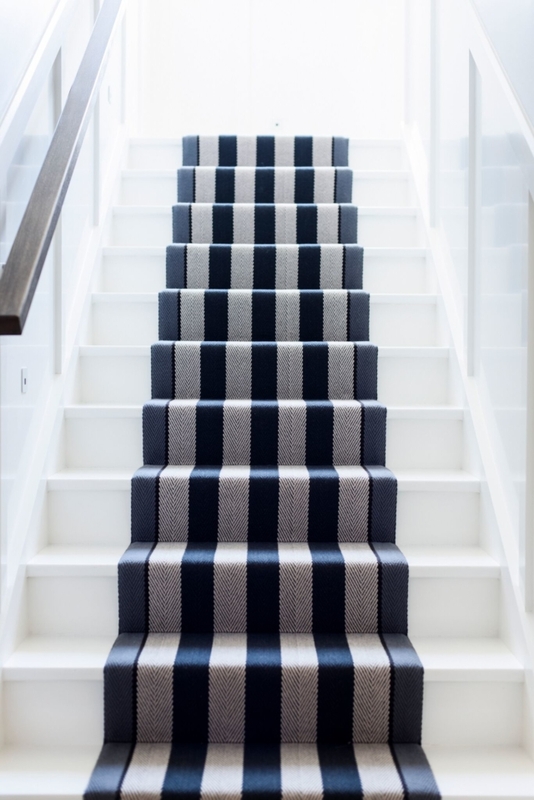 The hotel feel continues up the stairs (the bespoke Roger Oats striped stair runner is Kate’s favourite element of the entire build) and into the main bathroom. 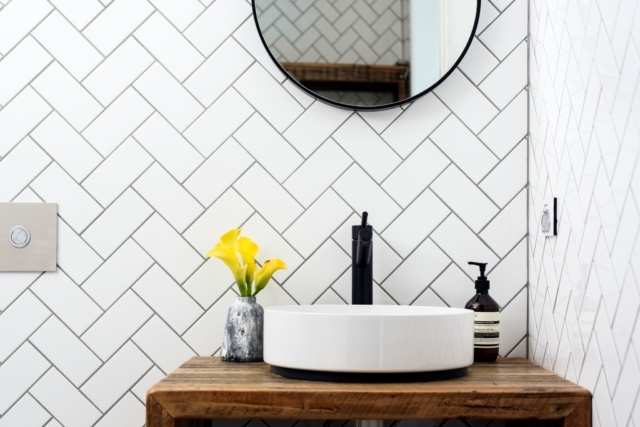 “The client definitely wanted high quality materials, so we introduced Perrin & Rowe, Victoria & Albert and Carrara marble into the bathroom. 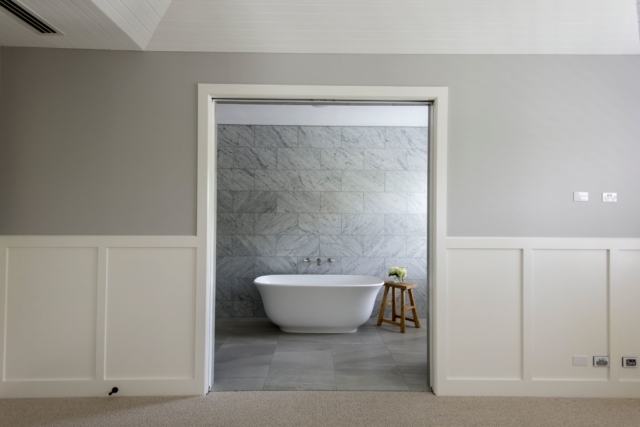 We wanted a hero bath and we also designed a ‘his and hers’ vanity which meant that we could centralise the bath through the entrance and make it a feature. The design is very high end,” says Kate. Just gorgeous and that walk-in robe!